Chennai: The much-hyped up event of Tamil super star Kamal Haasan’s ‘important announcement’ turned out to be a damp squib. The veteran actor appeared to be still hedging whether to come out forcefully in politics going by his apparent backtracking on the issue of making an important announcement. Contrary to expectation of his fans and people at large, Kamal Haasan did not come out with the name of his party, or manifesto or issues he wanted to highlight in politics. 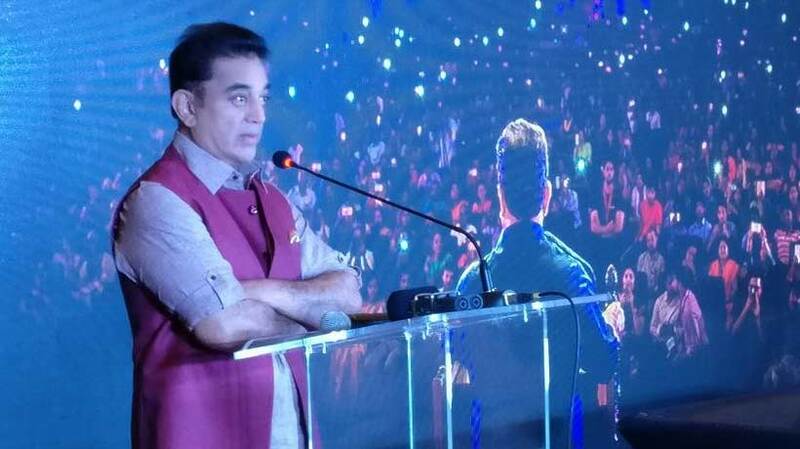 On Tuesday, Kamal’s team had invited a huge contingent of media, national and regional, for an important announcement even as buzz hinted at the launch of an anti-corruption App, a plank on which he was expected to build his political campaign, like the Aam Admi Party of Delhi. The App itself was not launched, as it was still under testing, Kamal Haasan said but elaborated that it would be a digital platform to reach the masses and through which masses can reach him.Addressing a press conference on his 63rd birthday here, he announced the launch of an app #KH with several links like “maiamwhistle” (centre whistle) and “theditheerpomvaa” (let us search and resolve). It will act as a digital platform for people to complain and interact with him, he said. Kamal Haasan also announced that from some time in January, he will embark on a discovery of Tamil Nadu journey to learn about people’s problems first hand. He then went on to elaborate on the Maiyyam App, which he said was a platform to air grievances. “At present, its testing was being done and its various features and properties were under guard. There is a team of 20 to 25 people working it and when the testing is done and we are ready, we will present the whole team before you,” Kamal Haasan said. “I am already in politics,” he said in response to a question. What he would like to do is to focus on corruption as an issue and for which he is bringing out the App, Maiyyam App, that is now under testing. “We have to keep it secret or else people will copy it,” he said.